The Honda Crosstour is a unique vehicle in today’s automotive market. The hatchback/wagon is a variation of the Honda Accord, and is smaller in size to the automaker’s compact SUV, the Pilot. Originally, the hatchback-wagon carried the Accord name in its prefix, which was eventually dropped in 2012. The Crosstour first hit the American roadways back in 2010, and competes directly with the Toyota Venza. 2015 marks the last year in which the Crosstour will be in production, and the full size hatchback-wagon is going out with a bang. The 2015 Honda Crosstour is available in four different model variations, starting at $27,530 with its base EX, and going up to $35,940, with its EX-L V6 trim level. While each model has its pros and cons, the EX V6 model features the perfect amount of power and luxury. The Crosstour not only allows for a unique driving experience, it also offers a great list of optional features that help to propel it into the future. Drivers who have the environment on their conscious, will be happy to learn that the 2015 Crosstour is relatively “green” in nature, and incorporates advanced technology to help lower emissions. The EX V6 is powered by Honda’s reliable and powerful V6 engine, with makes for a smoother, quieter, and peppier ride, compared to its four-cylinder counterpart. The middle-line trim level starts at just $31,190, and allows for not only power, but also added prestige. Check out everything that comes standard on the 2015 Crosstour EX V6 - a vehicle that certainly does not disappoint. Power & Performance - Powered by a V6 engine, this model gets an impressive 278 horsepower, and 252 lb.-ft. of torque. With a 24-valve SOHC i-VTEC valve train, the EX V6 is ready to conquer it all. For a V6, this model Crosstour still gets an impressive 30 miles per gallon on the highway, which is only one mpg less than the Crosstour models that do not include a V6 engine. Every vehicle that is manufactured in today’s world, offers drivers unique features for added convenience, comfort, and practicality. Honda engineers made sure that the 2015 Crosstour had enough standard and optional features that would fill this quota, and make the lives of those who drive one, easier. 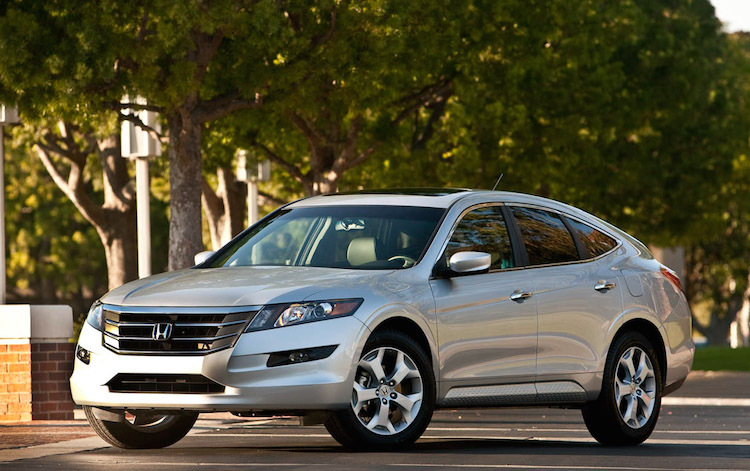 Check out a few of the exceptional features that are available on the 2015 Honda Crosstour. This hidden gem sits beneath the cargo area, and is a water-resistant utility box that is completely removable for ease-of-cleaning. A great place for wet towels, muddy shoes, or items needed in an emergency, this unique feature ticks off the convenience, and practicality aspects immediately. By adding to the field of vision on the driver’s side mirror, the blind spot area is reduced, and nearly removed as a potential hazard. This specialized ACE body structure is not only exclusive to Honda, is also is one of the elements that make the 2015 Crosstour a safer vehicle. Using a network of connected structural elements, crash energy is distributed more evenly throughout the front of the vehicle. This helps reduce the force from a collision to be transferred to the cabin, working to keep occupants inside the Crosstour more cushioned in the event of a crash. This safety technology works with the driver, by activating a camera on the side of the vehicle that your turn signal indicates. Live video displays on the Crosstour’s i-MID screen, allowing for the driver to see nearly four times more area than by simply looking out the window alone. Honda has always made it a priority to keep their vehicles as “green” as possible, by meeting environmental challenges head-on with advanced in-vehicle technology. The automaker was also the first manufacturer to offer production vehicles with an ultra-low emission vehicle rating, as certified by the state of California. Check out what the 2015 Crosstour incorporates, to help keep this tradition going. 192-hp, 2.4-liter, DOHC i-VTEC 4-Cylinder Engine - Crosstour EX and EX-L models feature this powerful engine, that is not only powerful, but also friendly towards the environment. Advancements like this one help ensure that vehicles on the road today, will be just as “green” tomorrow.